With the arrival of cooler weather, I just want to curl up with a hot cup of tea or even better-hot cocoa! One way to supercharge your hot chocolate is to add tonic herbs! These herbs can really help boost your immune system and keep you feeling great all winter long. I like to buy my herbs from a respected source like Gaia or Dragon Herbs, but there are lots of great sources. You can even make your own tinctures if you’re so motivated! The marshmallows here are Dandies, which are vegan. Be careful to read ingredients when you’re shopping for ingredients like this because many marshmallows contain gelatin from animals! Give your marshmallows a toast over an open flame for that extra cozy touch! 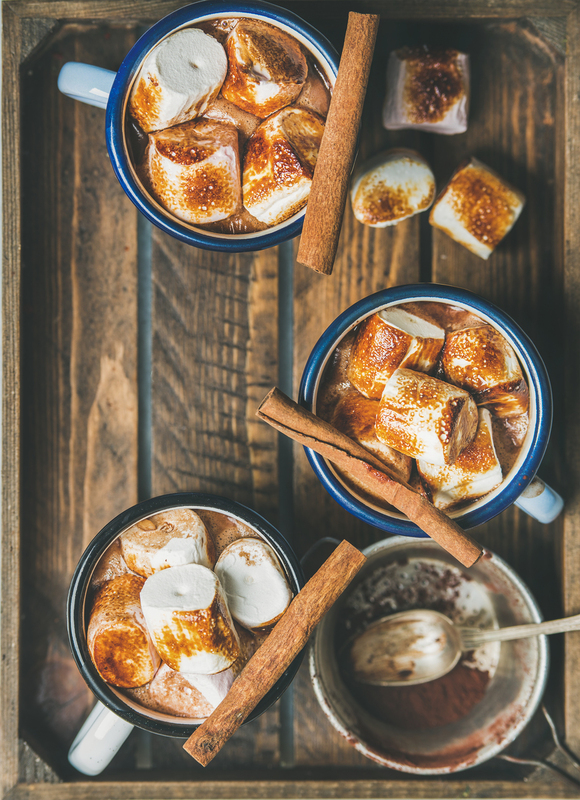 Warm and cozy hot chocolate pairs beautiful with fortifying herbs for the ultimate fall cocoa drink! Mix all the ingredients together in a blender and heat in a saucepan before serving. You can store the blended drink in your refrigerator and heat it as desired. It will keep nicely for a week or two. It is also delicious iced or as a base for a smoothie with a banana or two! Because there is caffeine in the chocolate and maca is a very energizing substance, I do not recommend drinking this late at night. Wow, it looks great. I love maca for its great health benefits and energy boosting qualities, but its taste is not always great and not everyone likes it, so I try always taking it with morning smoothie or salad or hot drink. Will try the recipe and will report the results here, thanks. Thanks, Sarah! I love maca too, and in combination other herbs it can be a very powerful tonic. I look forward to hearing your input!